Kelsey Timmerman adventured through the global food economy perfecting his machete technique. He was injured in a freak accident involving gamma rays and a GMO banana on a banana plantation. Armed with great powers and great responsibility, he now fights global injustice as the Banana Ninja! Here’s the Where Am I Eating cover! (I only had a low-res file, hence the pixilation.) A big thanks to Rule29 for the awesome design and to my parents for my rugged good looks. This bad boy will be hitting the shelves Earth Day (April 22nd). Now, I’ve consumed my fair share of Arby’s roast beefs over the years, so don’t think I’m above them. But nothing about their paper-thin slices of beef makes me think of freshness. Have you ever held up a slice? The anemic piece of meet shaved off of some poor feedlot cow is nearly see-through. If you’re interested in the writing I do, there’s a class for that. The last writing class I took was English 102 during my freshman year at Miami University. At least that was the last class until I audited Literary Journalism taught by writer Mark Masse’ at Ball State University in 2010. Now the class is online and being offered to anyone interested. (You would enroll as a non-degree (non-licensure) student. If you are interested, Ball State is now offering this class online with Mark. That means you don’t have to worry about driving to Muncie and finding parking on campus, or about wearing pants while attending class! Freedom! The greatest thing you can give is your time to another. Unfortunately I didn’t have loads of time this year to give. Between traveling for three months researching EATING, and speaking across the country, which had me away for more than 30 days, I was booked. When I did have free time, I spent it with Annie and the kids. I simply didn’t have the time to give as much as I would’ve liked. Therefore I feel like I wasn’t the Big Brother (through Big Brothers & Big Sisters) nor the ally through Teamwork for Quality Living) that I should’ve been. These are definitely two of my biggest regrets from 2012. I’ve been writing since 2001. I knew that I enjoyed sharing stories from the page. 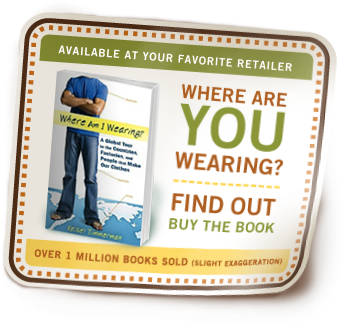 When WEARING came out, I started to receive requests to speak across the country. Who likes to speak in front of a large group of people? I’ve read that some fear the stage more than death. Eek! But in 2009 I discovered that I love sharing stories from the stage almost as much as sharing them from the page. The first time I stepped into a developing country was in 2001 in Thailand. I was wide-eyed. My senses were overloaded. Everything was new, everything was different. The more you travel, the less you see. I lived to write in 2012. I came across some amazing stories in 2012, but to do that I had to be away too much from my amazing family. Don’t tell my editor, but I wasn’t sure if it was possible to travel to eight countries (Costa Rica, Honduras, Colombia, Peru, Ivory Coast, Ghana, Burkina Faso, China) for research for three months and write an 85,000 word book in a single year. It is. Barely.